unmistakeable signs of North African influence, above. of charioteers of the Garamantes culture, below. 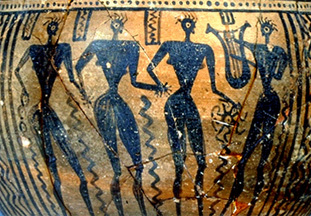 The facial profiles and bodily silhouettes in the bowl from the Geometric period in Greece are consistent with the style of the Libyan rock murals. Even the close-cropped hair styles signal African origins. The patterns at the bowl's center also resemble Egyptian lotus designs more than anything found in European art. This bowl dates to about 750 BCE. Above, mourners at a woman's funeral, on a massive amphora from Dipylon, circa 750 BCE. Note again the African profiles which are consistent with the style of Saharan rock murals. Women dancing in leafy ritual kilts on another archaic Greek bowl. southeast Africa, and more in an interview by Dr. Tonya K. Freeman.